On the night of May 22, Greene began constructing an assault position only 70 yards from Star Fort, hoping to overrun the fort quickly with a frontal attack. The Americans were driven away, however, by heavy cannon fire and an attack party from the fort led by Lieutenant John Honey which captured their tools. Greene and his chief engineer, Lieutenant Colonel Thaddeus Kosciuszko, then began digging siege trenches about 220 yards from the Star. Construction of the American siegeworks required twenty-seven days and included approach tranches, parallels, and artillery batteries. 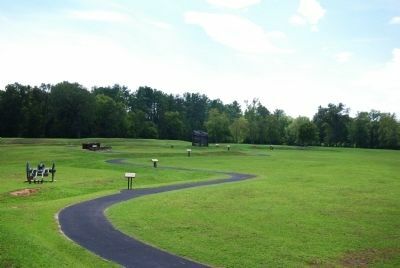 These features were intended to allow Patriot troops, supported by cannon fire, to move close enough to the Star to make a successful assault. The siege trenches you see from here are reconstructed outlines. 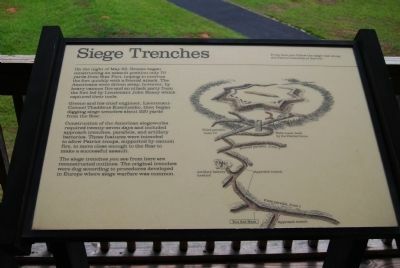 The original trenches were dug according to procedures developed in Europe where siege warfare was common. 1.121′ W. Marker was in Ninety Six, South Carolina, in Greenwood County. Marker could be reached from South Cambridge Street (State Highway 248). Touch for map. The marker has been removed from the park. Marker was in this post office area: Ninety Six SC 29666, United States of America. Touch for directions. Other nearby markers. At least 10 other markers are within walking distance of this location. The British Fortifications (here, next to this marker); The Patriots Lay Siege to the Star Fort (here, next to this marker); a different marker also named The Patriots Lay Siege to the Star Fort (a few steps from this marker); Patriot Soldier (a few steps from this marker); The Patriot Force Arrives (a few steps from this marker); The Artillery (within shouting distance of this marker); Trader with Pack Horse (within shouting distance of this marker); Island Ford Road (within shouting distance of this marker); Approach Trench (about 300 feet away, measured in a direct line); Second Parallel (about 300 feet away). Touch for a list and map of all markers in Ninety Six. More. Search the internet for Siege Trenches. Credits. This page was last revised on June 16, 2016. This page originally submitted on September 7, 2008, by Brian Scott of Anderson, South Carolina. This page has been viewed 757 times since then and 5 times this year. Last updated on September 10, 2008, by M. L. 'Mitch' Gambrell of Taylors, South Carolina. Photos: 1, 2. submitted on September 7, 2008, by Brian Scott of Anderson, South Carolina. • Kevin W. was the editor who published this page.